A Hug Is Just a Hug ... or Is It? Q: Is it okay to “bless” things in the Church? I’m thinking specifically of things like ashes, palms, or even wedding rings. A: Our current Agenda for Lutheran Service Book and its predecessors all have sections on blessing of new buildings and additions, new fixtures (organs, bells, altars, windows, etc. ), new paraments and vestments, and the like. The LSB Agenda has some seventy pages devoted to the topic, with both rites and resources. In the past, many Lutherans kept the practice of blessing the coming planting and growing season on Rogate (the Sixth Sunday of Easter). In some places, this practice continues. There are also churches (not necessarily Lutheran) that annually bless domestic animals (both livestock and pets). Others near ports and marinas hold blessings of watercraft. Parts of Christendom also observe the Rogation Days (25 April as the Major Rogation Day and the three days prior to Ascension as the Minor Rogation Days). “Rogate,” the traditional name for Easter 6, got its name from the traditional Gospel of the day. It means to ask or petition, based on Jesus’ teaching the disciples to ask the Father for what they need in John 14. It is never wrong to seek God’s blessing on godly vocational and recreational pursuits, let alone on those things that the Church uses in its proclamation of the Gospel. That in mind, however, I think that of the three things mentioned in your question, I would be much less likely to participate in the blessing of either ashes or palms than of rings. 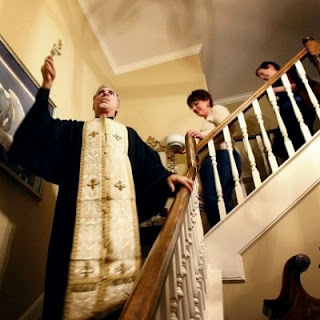 I think that house blessings are one of the most loving types of pastoral ministry in the flock, as the ministers visit homes and pray for the Lord’s protection of those dwelling within. So also the blessing of other structures where godly vocation is practiced. And if one’s vocation involves a truck or tractor, then blessing a Peterbilt or a John Deere likewise is right, fitting, and proper. There's at least one church around here that blesses backpacks at the start of the school year.